Graciously the President of France has invited Dear Leader to Paris for Bastille Day celebrations, which he and his wife will join after his meeting with Russian leadership in Moscow. 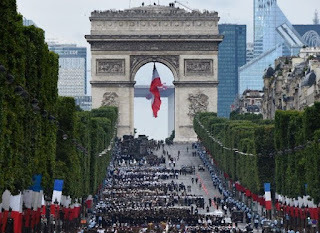 Both couples will attend the traditional military parade that takes place on the Champs-Élysees, which will include American troops this year to commemorate the centenary of the US entry in World War I. The revue and joint honours aside, the charity of Macron really strikes me as something really extraordinary—and not just in comparison to the imperial idiocy and ignorance of his guest, given that 14 July not only marks a revolutionary break with the past that did away with feudalism and fealty but also solemnly one year after the horrific truck attack on crowds celebrating their national fête and the World Cup finals along the Promenade des Anglais in Nice.